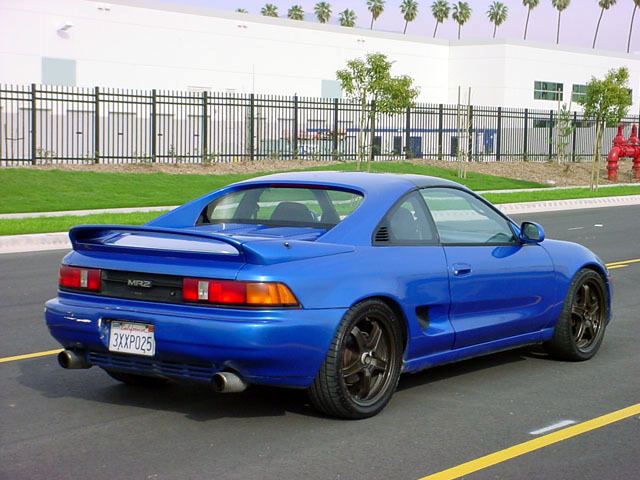 My blue Toyota MR2 was my second MR2, which I named 2blu2rbo2. I was totally excited when I bought it. 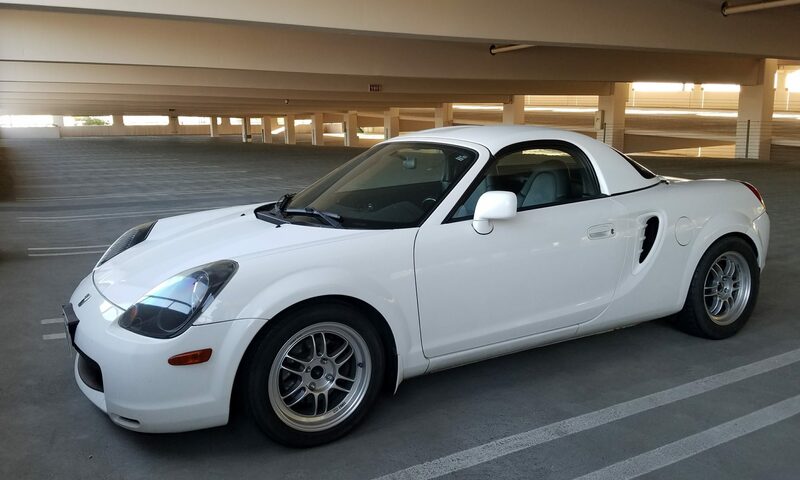 It was a major upgrade from my previous MR2. I went from my basic, normally aspirated MR2, to the other extreme; a totally upgraded MR2 with a massive aftermarket turbo. Read below for the repair, upgrade and maintenance log during the year I owned it. There’s also some of what I wrote about it in 2003. Wow, that was over 10 years ago. I bought the car in March of 2002 with about 124000 miles on the odometer. It is a 1991 Toyota MR2 with T-Tops and all the power options. I am the third owner of the car. The first original owner got in a minor collision where the rear left fender was dented. The suspension and other critical parts of the car were left unharmed. The owner then sold it to another person. The new owner repaired the fender and had the side moldings removed. After that he had it painted Viper Blue. The original color of the car was steel mist grey. The picture above shows how the car looked like when I bought it. Ever since then, I have been fixing some of the problems the car already had, as well as doing some maintenance and upgrades. Below is an update of what has been done ever since then. 01/28/03 – Installed JDM front bumper lights. 01/19/03 – Tightened loose nut on front right sway bar endlink. 01/18/03 – Oil Change at 140300. 01/16/03 – Installed 1.0 Farad digital capacitor for amplifier. 01/04/03 – Finished and installed amplifier case in trunk. 01/03/03 – Prepared wires for trunk-mount amplifier. 01/02/03 – Installed JDM rear amber side markers. 01/01/03 – HAPPY NEW YEAR! 12/30/02 – Replaced alternator voltage regulator. 12/10/02 – Adjusted front right head light cover. 12/06/02 – Tightened front right sway bar end link. 11/07/02 – Oil Change at 138000. 10/15/02 – Adjusted rear camber with crash bolts. 10/11/02 – Got new rear tires, Falken 235/40/17. 10/10/02 – Replaced left hand brake cable. 10/05/02 – Replaced plastic catch can with metal one. 09/22/02 – Oil Change at 135500. Installed fog lights. 09/10/02 – Replaced front left side marker. 09/08/02 – Catch can installed. 09/05/02 – Patched up front left tire. 08/25/02 – Oil Change at 133500. 08/22/02 – Replaced passenger side seat belt and glovebox. 08/18/02 – Replaced alternator brushes. 08/13/02 – Replaced header collector gasket. 08/06/02 – Installed Kenwood MP3 player head unit. 07/31/02 – Fixed alarm and turbo timer conflict. 07/27/02 – Got cup holders now! Wooo hoo! 06/30/02 – Oil Change at 131000. 06/17/02 – Adjusted front right camber and replaced various interior parts from MR2 meet. 06/16/02 – Replaced front right strut housing. The stabilizer link tab was broken. 06/15/02 – Installed the timer part of my Blitz Dual Turbo Timer. 05/27/02 – Adjusted parking brake. Relocated amplifier to center armrest. 05/25/02 – Moved aftermarket tweeters to stock location. Previous owner had them on rear a-pillar. 05/16/02 – Replaced transmission fluid with Redline MT-90. 05/11/02 – Oil Change at 128500 miles. 05/06/02 – Double wrapped leather steering wheel cover with blue lace. Repaired hole in tire. 04/01/02 – Oil Change at 126000 miles. 03/29/02 – Blue neon floor lights installed. 03/15/02 – Changed far left brake light bulb. 03/09/02 – Seats did not slide back and forth. Driver and passenger seat sliders were repaired. 03/01/02 – Engine temperature gauge was not working. Water temperature sensor was replaced.